The way I discovered DXing is probably no different to many fellow devotees. I’d had a keen interest in electricity even as a youngster, pulling apart perfectly functioning torches to see what made them work and borrowing library books on electrical basics. Around age 11, I started tinkering with crystal sets and after many dismal failures, finally made one that worked and after discovering that I could hear stations 100kms away, I was keen to hear more distant stations, thus by accident I became a DXer (though I never knew there was a name for it!). By constantly improving the crystal set with a better aerial, earth etc, then upgrading to a ZN414, I was able to hear more distant stations all the time. Of course, night-time was best and there were many stations audible, though because of the size of the dial, I often had only a rough idea of the frequency! The only other radio set in the house at the time was a modern Sanyo transistor job which could easily pick up stations 250kms away and I decided to hook up an external aerial and see just what I could eke out of it. I was amazed at just how many stations I could hear! And foreign languages too (the poor old thing was over-loading badly and SW images were omnipresent…). I would have liked a SW receiver though with my meagre savings I couldn’t afford any of the sets for sale in local second-hand stores. I continued to dabble with my parent’s radio, fiddling with all the tunable coils to maximise performance. Then one of those precipitous events. At age 14 I went fishing with a school-mate (Lindsay Tsukigawa) and en-route to the local wharf visited his father’s printing business for the first time. Ito was a keen radio fan and tuned in all the various sports events around the country. He had a large valve radio and this funny looking 40 inch square perimeter-wired box for an aerial. This strange device piqued my interest and a flurry of questions followed. As it transpired, not only was there a name for this obtuse hobby, there was a club for DXers in Oamaru! Ito soon introduced me to a guy who worked right next door at Perpetual Trust, Peter Grenfell and it wasn’t long before I was invited to the meeting of the North Orago Branch of the New Zealand Radio DX League in April 1974. I didn’t know what to expect at this meeting and took along my soldering iron and pliers (in case there were more radios needing “attention”) and after an explanation about the hobby, including the revelation that stations sent verification cards for reception reports, I was well and truly hooked, especially after logging Radio Netherlands on 9715kHz and sending off a report. .
Apart from Peter and Ito, other members helped shape my interest. Trevor Herron, Alistair Stewart, Ted Sutton and others talked about stations and countries I’d never heard of (let alone heard) and these guys were hearing US stations on mediumwave – incredible! Thanks to Ted Sutton, my crystal set and ZN-414 radio were replaced with a Philips 7-valve set complete with shortwave and a whole new world opened up for me. Before long, all my earnings on after-school jobs were being blown on postage, and after saving for a few months, I joined the New Zealand Radio DX League in August 1974. I had read of other DXers exploits in the North Otago Branch’s “Dial News” and the NZRDXL’s “DX Times” and was awestruck by the number and variety of stations that could be heard, especially on MW! Most enticing were the Yanks (as they were in a language I could understand) even though I was able to hear Australian stations with ease using my home-built loop and staying up Friday & Saturday nights waiting till midnight when almost all New Zealanders signed off. I was then able to log an Aussie every 15 minutes and 8 a night was easy going. (I had to modify the set to drive headphones so I could furtively DX without disturbing the family). Still, no US stations! I has assumed that I needed a better set or a better aerial. Then one night, I stumbled across this strong signal with what sounded like an American accent… it turned out to be KNX Los Angeles 1070kHz! And that’s all it took, the ice had been broken and before long, numerous US and Hawaiian stations entered the log book. The chase was soon on for anything remotely foreign and I used DX Times logs as targets. Asians, Latins, Pacifica, Middle Easterners, all eagerly chased and caught. During this formative period, I became a DXer, that is a chaser of exotic hard-to-hear stations and seeker of QSL cards as opposed to a shortwave listener. I have never been much of an SWLer, other than to listen to DX programmes or cricket commentaries from Radio Australia! (I found that I could combine fishing with listening to the cricket during summer… somewhere close to paradise!). And if New Zealand was one of the best countries in the world for DXing, due to it’s relative isolation and favourable propagation paths, then Oamaru was (and still is) one of the best places in NZ for DXing, again due to it’s relative isolation, as well as lack of local radio stations (we only have 1) and low levels of electrical noise. I was able to visit the shacks of other members of the North Otago Branch which boasted an impressive array of ex-military sets. Ted Sutton lived very close to me and Ted kindly encouraged visits to use his Marconi R-1155A. Peter Grenfell’s aerial system and Eddystone 680X were also trailed on occasion as was Trevor Herron’s Marconi. The performance of these specialist receivers was so far above my set that the hunt began for a better receiver. Friends in Dunedin were aware of my interest and loaned me a modern Philips valve radio with much better band-spread on shortwave and better performance, still it wasn’t what I was after. At the time I was a member of the Air Training Corps and managed to convince the adjutant to loan me a ZC-1 (restricted to 3 – 6mHz) which was a great performer though lacked MW. Unsatisfied with the compromises, I needed more money! It wasn’t until a job over the Christmas holidays at the local freezing works in 1975, that I had enough money to buy a decent receiver… the venerable Barlow-Wadley XCR-30. Now I had a receiver with real “grunt” and also a full-time job having secured an electrical apprenticeship with the Waitaki Electric Power Board. This receiver served me well for a number of years until early 1981 when a Kenwood R-1000 was purchased. This set was modified with a Radio West 1.9kHz mechanical filter to further improve performance and another modification to remove attenuation from the MW circuitry. The R-1000 is an under-rated receiver and would make a fine set for the average DXer. Despite my primary interest in DXing, I had also passed my examinations as a radio amateur and was receiving the NZART’s magazine “Break In” which had a good “Buy, Sell or Exchange” section. I placed an ad for a Drake SPR-4 and before long had swapped the R-1000 for the receiver I’d wanted for 10 years! It was still unmodified and thanks to Bryan Clark, I obtained modification details and a copy of the manual. The set was slightly tricky to alter though has been a fantastic performer ever since. In 2000 I obtained a Sony ICF-SW55 primarily as a portable and also for checking parallel frequencies. This set has also been under-rated and has provided surprisingly good performance even on MW (and I haven’t taken the back off to “adjust” it yet!). I’ve also experimented with aerials over the years and now have a combination of aerials, matching transformers, coax and earthing that makes the system as quiet as possible, both at Waianakarua and Oamaru. Please read the articles on the website. Another valuable asset has been the MFJ-1026 phaser. When you’re running a great receiver with a great aerial system and you feel like you need something extra… this won’t disappoint. A huge positive for me right the way through my involvement, has been the camaraderie between DXers. It is a rather selfish hobby yet the willingness of DXers to share tuning tips and advice has always been a feature. Face-to-face meetings with colleagues continue to be looked forward to and have been the inspiration for attending various gatherings. The North Otago Branch is very active, given the size of the region and in the 70’s and 80’s hosted many of the NZRDXL’s national Annual General Meetings. These events were very well attended by Administration Committee members from Invercargill, which gave me the opportunity to meet some of the leading lights in MW DX, i.e. Arthur Cushen, Merv Branks, Eric McIntosh, Ray Crawford & Sutton Burtenshaw. Bryan Clark from Wellington (later Auckland) was also a regular visitor and renowned DXer. In February 1976, I attended my first NZRDXL Convention at Otaki, hosted by the Wellington Branch. At this Convention I was introduced to the Drake SPR-4. Wow! What a receiver! Yet it would be another 10 years before I actually owned one. With the tremendous help of other North Otago Branch members, I’ve organized conventions at Camp Iona, not far from Waianakarua, in 1994, 1998 and 2002). Then another precipitous event… the establishment of a Beverage site at Waianakarua… which is well documented here. I’ve also been to another of the “hallowed turfs” of DX fame… in 1988 Mark Nicholls and I spent a week at Te Araroa… not easy to get to though well worth the effort. Logs include KSAI 936, Algiers 1422, KUIK 1360, WWNK 1360, KPOP 1360, KSAL 1150, KOFY 1050#, KPRZ 1210#, OBX4X R El Sol 900, KBLX 1400, KDIF 1440, LRA29 R Nacional, San Luís 1310, HCRC2 R Caravana 750, HJBI Ondas del Caribe 840, RNE Sevilla 684, SER Sevilla 792, CJVI 900, KPLY 1270, XERP 1330, KUTR 860#, CKRD 700#, CHQT 880#, KIXI 880#, KIEV 870#, KMJC 910#, KIQI 1010#, KBAI 1150#, KAHU 1060, La Voz del Tropico 4747 & R Globo 11805. (The # indicates stations logged in the wee small hours either as they signed on or changed fron night power to higher daytime power). I have been a regular contributor to the “DX Times” since 1975 and have sub-edited various sections since 1985 (MW Mailbag, Broadcast News, Dxísimo and more recently a new section specialising in pirate and clandestine stations called “Unofficial Radio”). My interest in technical matters and DXotica has also resulted in various articles, bandscans and specialist lists, serving as the League’s Competitions Secretary in the 1990s and for a period I maintained the radiodx.com website. I’ve also belonged to several other DX clubs (some briefly), New Zealand DX Radio Association, the Australian “DXers Calling”. International Radio Club of America and Danish Shortwave Clubs International. Now with the internet providing a catalyst for uniting DXers, the fraternal spirit is stronger and larger than ever. Actually getting to meet and greet international guests has been a very rewarding part of the hobby. Through the years we’ve hosted many overseas DXers both at home and at Waianakarua. Harry Weatherley, John Lund, Chris Martin, Rex Gillett and Bernhard Gruendl. Somewhere in between all of this, in 1982 Linda and I were married (I took my R-1000 on the honeymoon! ), Mark was born in August 1989 and Scott in July 1992, I moved house 5 times and I’m still working (indirectly) for the Waitaki Electric Power Board! 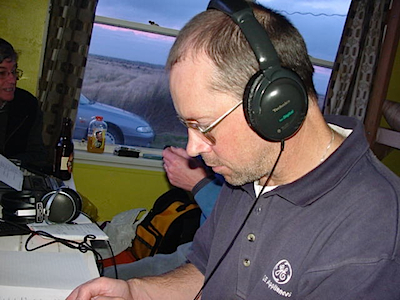 In 1996 Kelvin Brayshaw of the Radio Reading Service in Levin, asked if I could contribute a monthly radio programmefeaturing DX tips for their radio listener’s programme, centred around AWR’s “Wavescan” rebroadcast. This lead to the show being hosted by AWR and when requested by Radio New Zealand International, a tuning tips programme has been prepared every two weeks which has since been picked up by AWR for inclusion monthly on “Wavescan”, as well as on HCJB’s “DX Partyline” and more recently, fortnightly on Radio Korea International’s “Multiwave Feedback”. The North Otago Branch, through the auspices of Peter Grenfell has long been involved in the League’s archives. The League has Peter to thank for the foundation and maintenance of the archives since the early 1970’s and for it’s final resting place at the Hocken Library in Dunedin. I’ve recently taken over the role of archives custodian from Peter and they’ll be big shoes to fill! 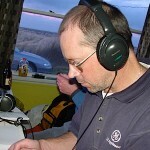 My interest in archives has been reinforced since David Ricquish initiated the radio heritage collection at radiodx.com. You’ll find a large number of very interesting articles on the history of radio and DXing, particularly in the Pacific. The North Otago Branch had a “shack” for meetings and casual DX. The shack was on a reserve above Oamaru, around 150 metres above sea-level. Reception was very good with low levels of noise and several aerials to chose from. Initially, aerials at the shack ran through pine trees, and when they were later felled, a short wire was run to a set of rugby goal-posts about 50 metres away in the paddock (it was with this simple wire that I logged many good catches, including WIZM La Crosse WI 1410kHz). In need of something more permanent and to maximise surrounding land, we obtained some telegraph poles and with the assistance of Stan Vincent and a truck, we dug holes and strung up a new antenna approximately 150 metres long in an Easterly direction. This antenna also provided many good catches (best being Radio Trinidad 730kHz one night when auroras had flattened everything else) however, civilisation was advancing on us with new houses (and much increased levels of interference) debilitating the sites DX potential. The effects of new-found neighbours, rising rates and electricity costs, forced us to abandon and demolish the shack. Ahhh! !… the memory of fish’n’chip suppers and Muriel Bloxham’s scones.. I recall John Newman (a branch member resident in Twizel about 2 hours drive inland) inviting me for a spot of DX at the shack one night in 1975… John didn’t use the shack, he sat the loop on the roof of his car adjacent to the shack, and DXed with his Barlow Wadley inside the car. With this combination we heard numerous Yanks including KXYZ Houston TX 1320kHz at good levels. Trevor Herron used to live around the corner from me and often gave me a ride to Club meetings. On one occasion, we drove to Lookout Point, about 200 metres above sea-level, high over the harbour, and with his car radio we were able to tune into several Yanks including KOB Albuquerque NM 770kHz at very good levels. Such were the DX-properties of Oamaru, that in the late 70’s I used to DX with my car radio at Waitaki Boys High School, prior to the start of night-classes and I recall vividly one night when R. Tropicana from Ecuador was belting in on 540kHz! My early DXploits were in Reed St, where Dad had run an aerial from the house into the back yard. This aerial powered my crystal sets and the mantle radio though at this early stage I didn’t know what DX was, and hearing 4XO in Dunedin and Radio Hauraki in Auckland were my chief accomplishments. I attended my first North Otago Branch meeting shortly before we shifted. In April 1974 we moved across town to Stour St, and an aerial was quickly installed down the section. I lived there till Linda and I married in 1982 and by that time, there were several aerials in place and the Philips’, ZC-1 and Barlow Wadley had all aided in lifting my QSL tally. When we first married, we lived atop Eden St in rented accommodation and the only aerial possibility was a short wire from the spare bedroom down the section for about 15 metres. DX from Waianakarua was much better so little listening went on, yet on one very memorable occasion I was tuning around and found a signal with C&W music on 570kHz… not knowing what to expect, I stayed listening and was stunned when the station identified as WNAX Yankton, South Dakota! We purchased our own place in Avon St. later that year, high over Oamaru with good views out to the sea. My indoor loop aerial performed very well under the concrete tile roof which suggests that they don’t perform so well under metallic rooves. From Avon St. I managed some great logs, namely R Seychelles 1368kHz, Reunion 729kHz, Bahamas 1540kHz and pride of place, Manx Radio 1368kHz. In 1991, needing a bigger section and more convenience, we shifted to Greta St. Also with a concrete tile roof, the loop once again proved itself with MW logs of several Brazilians, Uruguayans and Argentines. An 11-metre high pole provided a good position to run wires from, yet reception seemed to deteriorate largely due to the onset of a noisy environment. The problem of electrical inference became so severe (due to every new appliance seemingly emitting injurious QRM), that I embarked on a process of eliminating the noise as much as possible, yet retaining marital bliss (i.e. thoughts of replacing our flash, new electronic washing machine with a wash-board weren’t considered for very long). A new, efficient aerial system capable of returning DX to the dials resulted. As mentioned earlier, I have always been more into DX than SWLing, and despite the poor verification rate and relative difficulty in receiving them, MW Latins have drawn me like a magnet! At first it was definitely the difficulty in hearing them that enticed me, then coming to grips with the language and overcoming the stigma of poor reply rates. End result, after hundreds of hours swooping across the dials – over 300 MW Latins verified… and I ain’t finished yet! Like most DXers, I went through a relatively quiet spell. In 1980 other matters (a steady girlfriend – later wife) seemed more important. I even sold the Barlow Wadley and was receiver-less for about 6 months. My radio interests weren’t strictly limited to SW & MW. I did have a fling with utilities on a couple of occasions and chased FM DX from 1986 till 1992, verifying 5 countries including KSBS Pago Pago, American Samoa, 92.1MHz 3kW and 4100km distant! I also owned a CB set and was very active in the late 70’s, and operate as a licenced ham in the mid 80’s… yet none of these diversions tempted me like MW & SW DX and were ‘shelved” for a future date! My first Convention was at Otaki’s “Tatum Park” in February 1976. Fellow North Otago Branch members Peter Grenfell, John Newman and Phil Hope flew north to Wellington where we were met by Wellington Branch members are driven to a rendevous at Avalon before heading out to the site. Notable DXers in attendance included Tony King, Bryan Clark, Chris Martin, Barry Williams, Tony King, Harry Weatherley, Robin Chambers, John Durham, David Ricquish & Ray Crawford. We were assigned cabins to sleep in though I quickly spied a Drake SPR-4 belonging to Derek Benfell (and now owned by Bryan Clark) which Ash Nallawalla and I shared for some memorable logs. Reception was very good and I’m sure propagation was favourable. Net result: very, very little sleep until the flight home and a heap of reports taken. Reports were sent to Singapore 790, AIR Rajkot 1070, Hong Kong 610, VOA Rhodes 1259, Burma 955, CFRB 1010, Muich 1602 and heaps more. Other things to lodge in the memory were the famous “Radio Guano” broadcast; Bryan Clark running around in his night-shirt to talk to CJVB’s Theo Donnelly on the phone; bad weather – good reception; Copal digital clocks; Paul Edwards and I falling asleep during one of those awe-inspiring talks; fish pie (oh! how I hate fish pie..); a super-hot curry enjoyed enormously by Ash; a visit to Avalon hosted by the late Bill Pearson; Nigel Robins waxing lyrical in Russian; the plane home delayed by 6 hours; Cook Islands specials; logging Afars & Issas on Tony Marr’s R-4. The following year off to another Convention. We rendevouz’ed at Bob Boundy’s for lunch then a visit to Radio Avon and off to the site, the ex-army barrack complex of Otokitoki Camp at Godley Heads, overlooking the Pacific. What a beautiful site for DXing! Some top DXers participated, e.g. Paul Aronsen, Keith Barton, Merv Branks, Sutton Burtenshaw, Ian Cattermole, Norm Maguire, Ernie Moore and Zmike Smith. Logs were made of R Caymans 1555, HJER R Pacifico 1030, HJPM R Galeon 1450, R Paradise 1265, OBZ4N R Union 880, VL2NI Norfolk Is 1570 50 watts, KHLO 850, R Jumbo 545, HCNY2 R Cristal 870, ZYD71 Reloggio Federal 4906.5, RRI Semarang 3935, Sana’a 9780, RTM Tanger 9615, Sri Lanka 15425, AIR Lucknow 3205 &, RRI Mataram 3223. Lingering memories: Keith Glover from Radio Australia enchanting us all; KFC for dinner; a trip to Akaroa in Phil Brooks’ low-level flying machine; Brian Withers’ car running out of water on the way up the steep hill; Professor of Overalls Gerald Harper’s exact compass pointings; Norm MaGuire losing his contact lens in the latrine; Chris Martin running aerials down a cliff; “Yellow Bird” emanating from R Caymans on 1555kHz; good weather – good reception; more sleep this time! For the third year in a row, it was off to a convention. This one at the legendary Tiwai and a number of top DXers were in attendance, amongst them Steven Greenyer, Eric McIntosh, John Allchin & Eddie Macaskill. Expectations were for some terrific loggings. Amongst them HJEW R Reloj 1110, R Paradise 1265, Vienna 1476, Kosice, Czechoslovakia1520, HJLK R Calidad 1230 & Sennar, Sudan 1296. WLEO Ponce, Puerto Rico 1490; WGIT Canovanas, Puerto Rico 1660, CKMW 1570, CKEG 1570.